I really wanted a white Christmas tree this year, but not for a $400 price tag. I got a cheap $30 tree from a Liquidation Store and some spray paint and gesso and went to work creating my own. What i used... but maybe I didn't really need the spray paint. 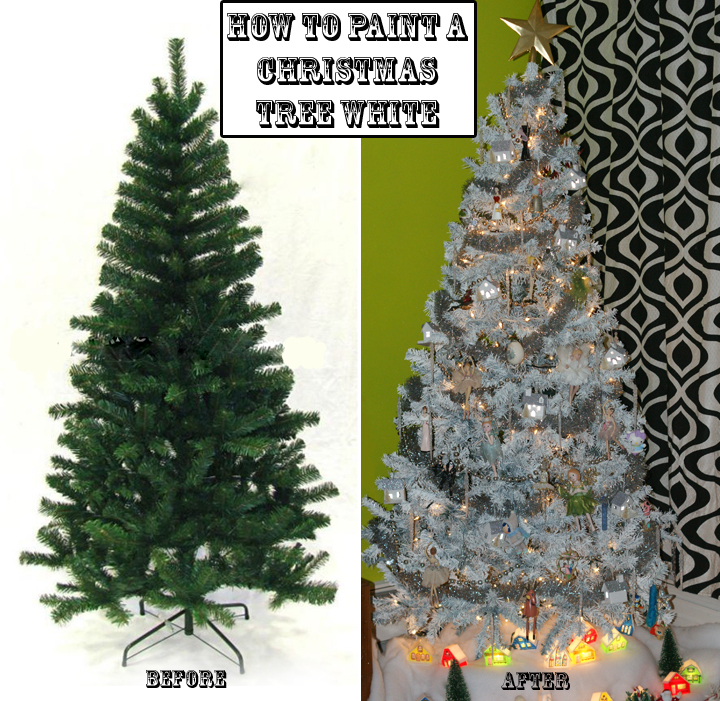 In a well ventilated room I spayed down my tree using the cheapest spray paint I could find. I though 5 cans would do it, but I ended up needing 10 cans to do my entire 6 foot tree, top and under the branches. This is the result of 1 coat of spray. You can see it covers pretty well, but it still is not a true white. It is incredibly hard to spray an artificial tree because each bristle is matted beside the other. You have to put your hand out and spread them all apart to get true coverage. This is pretty impossible using a spray. Also my fingers really started to hurt after using 5 cans of spray paint. Since I was not happy with my hazy grey tree and wanted more white I decided spreading paint on the branches with a gloved hand would work best. It really does work well, but when dry you get many globy masses of bristles all stuck together. To the eye it looks just fine, but when you touch, it feels hard and icky. I'm wondering if I could have completely skipped the spray paint at this point? In the next photo you can see the 2 types of paint I experimented with. The best result were with Gesso. Gesso is a very thick paint used to prime canvas, and you can find it in craft paint sections of department stores. It can be more expensive then a gallon of regular paint, but I have heard it is possible to mix your own using latex paint and white glue. Not sure how that would work out here. I had some white latex primer sitting in my closet so on one side I wanted to try it out to see how good it would work versus the gesso. Results were not near as good, and would require a second coat. 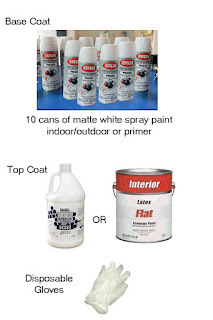 Since it is a ton of work to spread paint on every branch I would go with the gesso to save time. This photo shows the latex on the left and the gesso on the right side of the tree. The dark pots deep in the branches are spray paint only. so you can see that although the spray paint does cover a great deal, it is still rather gray. If i wanted a colored tree, like a pink tree, I would now get some spray paint and go over everything. If I didn't get my tree completely white and tried to spray it a color, it would not look very bright.